The Dwarfington Southbound passing the semaphore distant signal showing Vr 0: caution - expect stop. 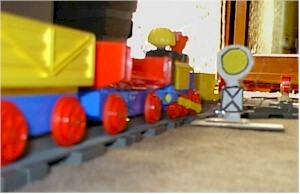 The Dwarfington Southbound, still at full speed, approaching the main signal at danger. On the right you see the descent from the bridge where the Fairyline Freighter will appear just within seconds. 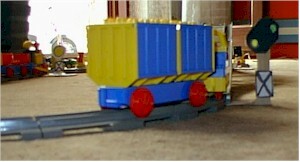 The Fairyline Freighter on its descent from the bridge, passing the main signal at Hp 2-slow. 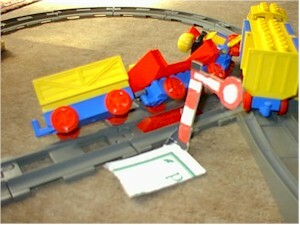 In front you see the Dwarfington Southbound which has already occupied the points, the accident is inevitable now. 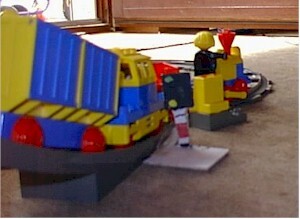 The derailed Dwarfington Southbound and the Fairyline Freighter immediately after the accident. Top view of the scene. The Fairyline Freighter is still on its tracks. 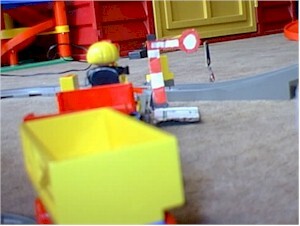 Note the special style of the points signal: this one is only used at Duplo points. 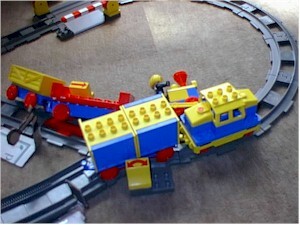 The subsequent investigation revealed that both trains were driven by the same person, who was also in charge of being the installation's signalman. .